I haven’t done a Teacup Tuesday in awhile. Fortunately, I took this picture last Tuesday. Why is that fortunate? Well, my dear camera is broken. As I haven’t been to a camera professional to discuss the problem yet, I don’t know just HOW broken it is. I’m really, really hoping that it is fixable and an inexpensive fix at that. I use my DSLR camera so much that it feels like an extra limb. I take photographs almost every day. In fact, I celebrated my birthday last week, and I had decided to do a photo-a-day project for all of the next year. Sadly, my camera broke on day 3. Sad. This is my newest teacup, and I adore it! I love the clean, whiteness of it–the silver edges, the soft pastel flowers. The tea is Salted Caramel! Oh yum. My mom sent me the tea bag in the mail, and now I can’t remember the brand. 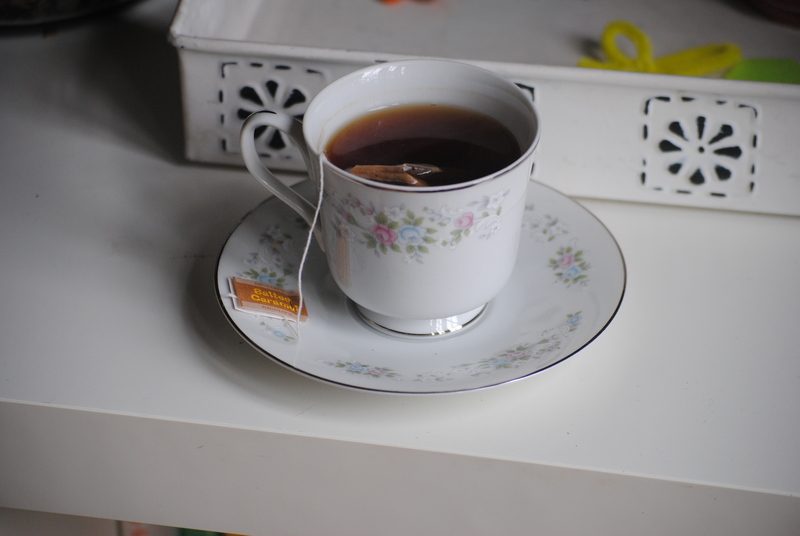 It was such a welcome change to my usual tea choices. Thanks, Mom! I love that tea!! Your mom sent me one too! I can’t remember the company either. 😦 Live your your beautiful tcup. Love you even more. Me llama MUCHISIMO la atenciÃ³n y es una de mis grandes esperanzas en este Verano. Así a bote pronto la definiria como una mezcla de los Goonies y E.T. que tiene pinta de ser maravillosa.